Bytable was founded to increase market access for quality food producers. 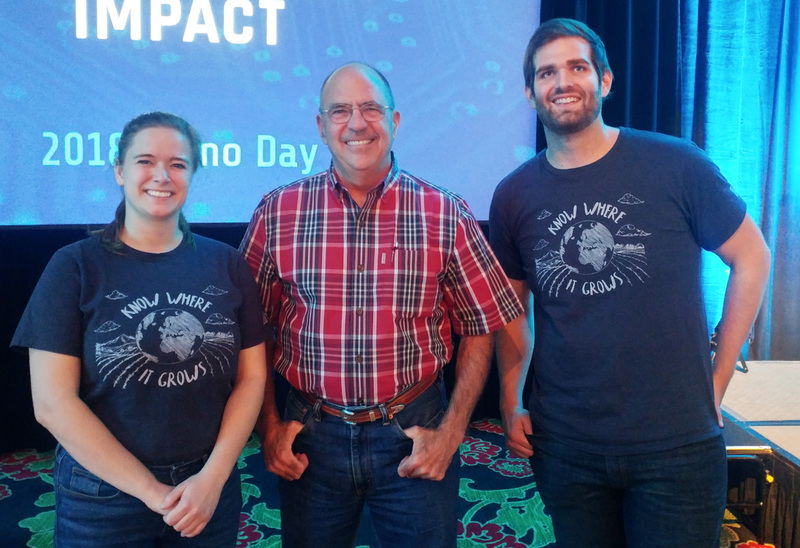 Cofounders Jacy Rittmer and Brett Dugan at Exponential Impact Demo Day with Mike Callicrate. What originally began as an online marketplace for local foods in the summer of 2017 quickly grew into a movement to change our entire food system. With the rise of new technologies like blockchain and internet of things, founders Brett Dugan and Jacy Rittmer saw the opportunity to use their food and technology backgrounds to create a new kind of food system - one that supports quality producers and gives consumers the tools to make the right decisions about the food they buy and the companies they support. Cofounders Brett and Jacy are Iowa natives with a deep passion for changing for food industry for the better. Jacy is an Iowa State University graduate with a B.A. in Biological and Pre-Medical Illustration and 5 years and counting experience in the food industry. She is a self-taught web developer with a background in design and marketing. Brett is a University of Northern Iowa graduate and systems architect with expertise in the AgTech industry. Brett's passion for informed health and better market opportunities for food producers led him to apply his talent for creative problem solving to the problems facing our food system. To rebuild our food system from the ground up through traceable and transparent food. Our current food production system is broken and unsustainable. It's polluting our air, ruining our soil, destroying our water supplies, and ending rural America as we know it. Ranchers and farmers make only 14 cents per dollar, compared to 30 cents in 1980. A complete lack of transparency in the food system means food companies, the government, and consumers are left in the dark about where food is really coming from. It can take months to track down the source of a contamination, and food fraud is rampant in nearly every segment of the food industry. The cost for businesses affected by a recall is over 10 million dollars, and food fraud costs the industry 40-50 billion dollars every year. There are amazing food companies doing wonderful, sustainable, regenerative things, but their language has been stolen from them. Terms and certifications that are supposed to mean something are being misappropriated - and the producers doing the right thing are the ones who suffer. And consumers are placed with the impossible burden of making the right choice about the products they buy and the companies they support. With transparency in the food industry, we can fix all of this. Bytable is making food traceable and transparent. We create trustworthy data chains that track products from farm to fork using blockchain technology and internet of things. With traceability and transparency, we reduce costs, limit risk, and build quality brands for every stakeholder in the food supply chain while giving consumers the tools they need to make better decisions about the food they buy and the companies they support. Bytable makes doing the right thing easier.